Recent controversy reported in the Australian Newspaper in this article focussed on a large grant awarded by the Australian Research Grants Council to a proselytising social "scientist". The recipient, Professor Riaz (Risible) Hassan expressed gratitude that the lavish funds would allow him to interview terrorists in order to prove that his existing beliefs about the causes of terrorism could be verified. Of course, his a priori beliefs about the causes of terrorism seemed to be in accord with those often expressed by terrorists. No surprises there. The simple-minded actions of the ARGC in approving such a grant, and the simple-minded attitudes of the recipient are ample evidence that some social "scientists" are still living in a pre-enlightenment, or even pre-socratic epistemological world. 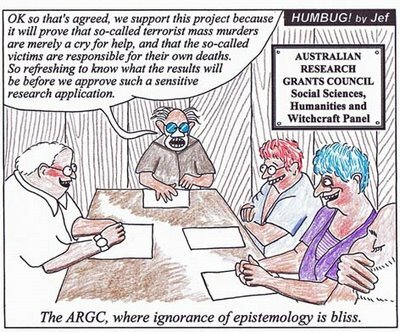 A world of magic and mysticism, where the purpose of "research" is to count the hits and ignore the misses, in order to confirm existing prejudices and superstitions. Note that I am not critical of all social scientists. Some are not ignorant of basic epistemology, and some are out there fighting the good fight.